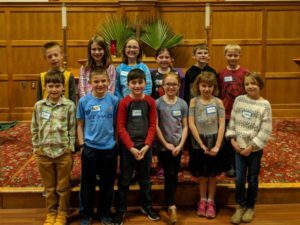 The Bread of Heaven Workshop – Communion bread is made by the children at a workshop held at the church in the kitchen. The children make the bread which is then used for communion at their First Communion Worship service ceremony on Maundy Thursday. The Cup of Blessing Workshop – A one hour workshop held at a local pottery studio for children 2nd grade and up, to learn more about the Lord’s Supper. They create their own Communion cup to be used at their First Communion.